Still not sure if I'll venture to the theater to see Wonderland. For very obvious reasons, I suggest The Skinner! 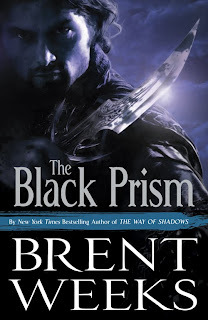 I loved the Night Angel trilogy and I can't wait for the Black Prism to come out! And I agree, I think the new cover is much better than the first attempt, it shows that it is a new series and not a sequel to the Night Angel trilogy. @Alex - It may be a rental. @Neal - Okay if you stop by the blog that means I have to read your book. That is unless Alastair shows up and than you two'll have to thumb wrestle to see who is superior in my eyes. I might win the thumb wrestle, but he'd trump my on astronomy.